You should have come from Joni Andaya‘s Blog. Don’t worry I will share the list of all the participants of the blog hop towards the end of the post. Paulina has release three awesome new dies this month. They are called Stitched Labels 1 dies, Picket Fence die and Stitched Banner dies. I LOVE basic dies which are versatile. Pretty Pink Posh’s dies are those with awesome stitch details as well. The Stitched Banner die caught my eye the most. This is because I want to decorate my craft room. At the moment it is very functional. But I like it to look pretty as well. I want to do it with DIY decors. One of the decors is to hang banners from my shelves. I made my own banner using the Stitched Banner die set. Here it is. I die cut the six stitched banners and the smaller square panels using black striped pattern paper. The pattern paper is a retired paper form Stampin’ Up! I then used one of the dies from Stitched Borders 2 set to die cut the gold glitter paper. I adhered the gold diecut to the top of the stitched banners and the edges were trimmed off. I used Papertrey Ink alpha dies to die cut “CREATE” alphas using gold glitter paper. I adhered these alphas on the square panel which was then adhered to the banners using foam adhesives. I ran natural twine on the back of the banners and secured the twine with some tape. Then added some tiny pegs to fake hold the banners to the twine. You next stop is to Maureen Merritt‘s blog. Here is the list of all the participants of the blog hop. Make you you leave comments on all the blog posts because there are two $25 gift certificates up for grabs. Winners will be picked randomly from any of the blog post. The comments close at 11:59 PM PDT on 3/11/2015. Wow! I love the banner you created with this die, it's gorgeous! The black and gold is stunning. Such a COOL banner! Think I need to make one for my room! Wow! Love the banner – so creative!! Your banner is beautiful! It must look great in your room! Your banner is so dramatic, bold and sensational and really lets your stunningly glorious cards shine even brighter. What beautiful colors you have used in your banner! Very original! I look forward to seeing the others. Very cool. The banner is spectacular under your moose. Really love the way your banner turned out Gay. Great combo of colors. Wow! What an elegant banner! Those banners are AWESOME! Love the black paper that you used with the gold accents. Very classy! Great banner!! Thanks for sharing. Very gorgeous banner! Your work is spectacular! Oh my goodness, sooooo pretty!!! WOW! 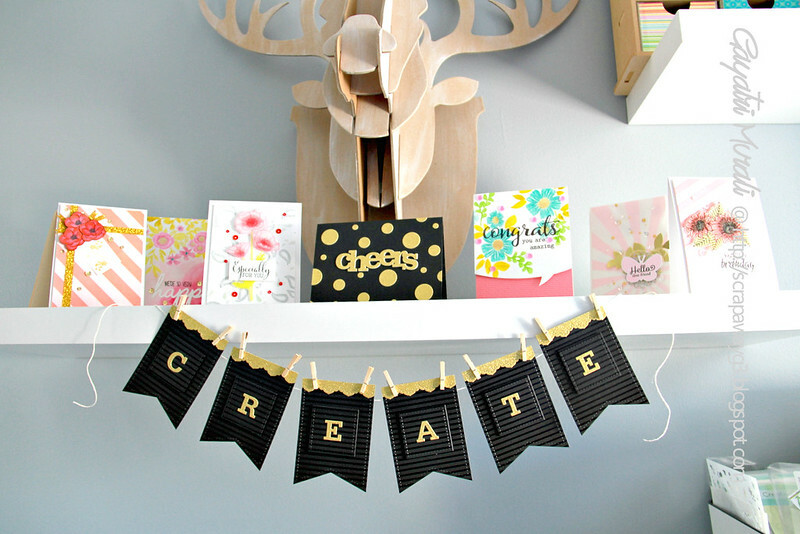 Your craft room is beautiful and the banner adds just the right zing!! Love this, Gayatri! Fabulous banner! I was so focused on how to use the die on cards, that this hadn't even occurred to me! This die is so versatile! love the banner too and what you created with it – fantastic!! Oh my goodness I HAVE to have this banner die! EEK! It is SO cute. I love how you did yours. Its awesome! Love this cool banner, so fabulous!!! The banner looks great! What an original idea! Love your banner, very creative. Love the stitched banner dies. Fantastic banner, I needed this die a couple of months ago!! This is so cute! I love your idea of using the die to make a home decor item. I'll be looking for your other posts about the banners. What a Fabulous banner, love the colors! Wow this banner is AMAZING!!! absolutely LOVE the tone-on-tone striped black paper with that golden glitz!!! luv your design and colors using the PPP banner die – fantastic! What a striking banner! I love the gold and black combination! everyone I know would want that classy banner! Such a cute banner! Would be fun to make for my studio. Cool banner! It really makes a nice highlight for your card creations. totally stunning Gayatri. The black with the gold is a perfect match. OMG Your banner is gorgeous…WOW girl talk about coming up with the perfect colors and papers…WOW you really did one outstanding creative job and showcased these dies in a grand way!! Awesome hop post! Love the banner made!! Fabulous!! Gayatri! How wonderful… keeping this idea on hand for a special 10-year-old! This banner looks awesome! and all your cards are amazing! Pretty Pink Posh always has unique designs. Love the card!! Great banner!! LOVE the colors and your cards ROCK!!! TFS! This is great! I think I need that die! I love the black and gold on your cute banner!! So fabulous Gayatri! The black is so striking. oooo! this is GREAT!!! enjoy your décor!!! I love your bright, fresh projects! So adorable! I am envisioning so many uses for the Banner Die…great job! What a stunning banner. I love the elegant colour scheme and the touch of glitter is awesome. Wow, your banner looks amazing and love the black and gold combo!! Your banner is a great idea !! What a cute idea Gayatri! Love the black and gold – so trendy & glam! Nice banner and love all of the new release, I’m off to hop!! TFS. Great job on that banner. It is fabulous! Love black and gold together. It is so eye-catching and just gorgeous. Love the banners! The colors are fabulous. Love your pretty banner. Such a great way to decorate your space. Wow that banner is stunning!!! Awesome banner!! What a fabulous way to use the die. The colors you used are terrific! Great way to decorate your room…love PPP dies too. Fantastic Banner!!! I agree…the three dies you show being released this month are awesome must haves!!! Love the banner – there is so much inspiration out there for those banner dies. LOVE IT! GORGEOUS banner Gayatri – BOLD BLACK, GLORIOUS GOLD and BEAUTIFUL!!! LOVE your ELEGANT design with the stitched banner panels and the dimension of your stitched squares too!!! What a WONDERFUL banner and the colors are awesome!! That banner ROCKS!!! I love it!! The banner is so elegant in gold and black! I find I'm really into black lately, but now I have to try black and gold too. Love your bold banners! Gorgeous! Stunning! Elegant! Aw… you are so amazing! LOve Love Love the banner so so much!!!! You make me so eager to buy the dies! Fantastic banner Gayatri. Love the elegant black and gold together. Fantastic banner and love the black and gold look with those cute banner stitches along with the gold letters! Lovely banners! I am in love! What an absolutely beautiful banner!